FayeBSG have attended and participated in the Cupertino and Santa Monica SugarCRM World Tour and finish the event off by hosting one of the closing sessions in San Diego. The world tour started in Calgary, Canada on October 15, and included stops in Vancouver, Denver, Portland, London UK, Cupertino, Paris France, Santa Monica, Texas and will finally be in visiting San Diego on November 13, 2013 at the Hilton San Diego Bayfront hotel. SugarCRM is the market-leading customer relationship management (CRM) company that enables effective customer engagement enterprise-wide. The World Tour includes the introduction of the next generation, innovative CRM software – Sugar 7. CRM has evolved Sugar 7 focuses first on the needs of the user who interacts directly with the customer. SugarCRM has shifted their focus to leveraging a smart, fast, social customer engagement platform, so that every customer-facing professional across the enterprise knows their customer better, does their job better, and delivers a consistent, superior experience. Faye Business Systems Group is a Southern California-based technology consulting and Software Company with over 25 years of experience helping growing companies become more profitable by working with them to optimize their financial and business systems. FayeBSG uses SugarCRM, Sage 100 ERP (formerly MAS 90), Acumatica, and a variety of custom software solutions to meet client needs. Services include software development, project management, packaged software implementations, custom software implementations, integration, consulting, training, and support. Faye Business Systems Group has completed hundreds of successful ERP and CRM projects, specializes in integration and custom development, and is one of Sugar's leading North American Gold Partners, as well as an Authorized Sage Reseller and Developer. They are also known for their award winning integration applications based around SugarCRM. SugarCRM delivers an integrated solution that empowers every user who interacts with customers to better understand and engage their customer, so every connection drives value. SugarCRM’s market-leading open Customer Relationship Management (CRM) platform delivers the agility, flexibility, and security required to equip each customer facing professional with the information and tools they need to know their customers better, do their job better, and deliver a consistent, superior customer experience across the organization every time. SugarCRM applications have been downloaded more than 11 million times and currently help over 1.2M end users across disciplines effectively engage their customers. Over 6,500 organizations have chosen SugarCRM's On-Site and Cloud Computing services over proprietary alternatives. SugarCRM has been recognized for its customer success and product innovation by CRM Magazine, InfoWorld and Customer Interaction Solutions. 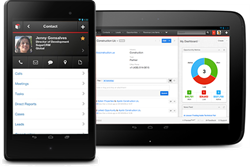 For more information, call (408) 454-6900 or 1 87 SUGARCRM toll-free in the US, email contact(at)sugarcrm(dot)com, or visit http://www.sugarcrm.com. You can also connect with SugarCRM on Facebook, Twitter and YouTube.